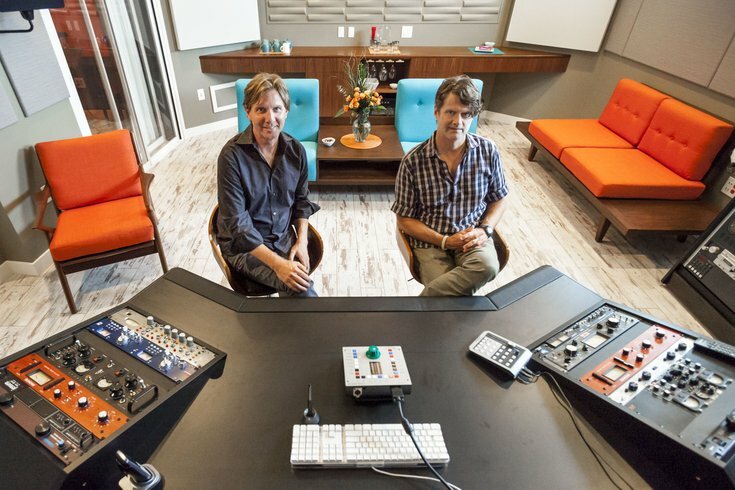 MilkBoy's co-owners, Jamie Lokoff (left) and Tommy Joyner in their brand-new Shake Audio Post studio, a division of MilkBoy entities that includes MilkBoy Entertainment, which co-produced Slow Learners. The 7.1 surround Shake studio is the place to polish a film, video, broadcast commercial, or digital campaign with the latest in audio production facilities. In the two decades since it was brought to life, MilkBoy has grown from a scrappy North Philly recording studio financed on credit cards to a booming mini music empire that's worked with everyone from The Roots to Miley Cyrus. Starting out in Ardmore in 1994, the brand quickly found a local indie following before eventually making the leap into live entertainment with all-ages music venue MilkBoy Coffee in 2005. Stretching their legs further into the biz, co-owners Tommy Joyner and Jamie Lokoff opened MilkBoy Philly, a Center City live music venue and restaurant, in 2011. Before closing up MilkBoy Coffee in 2013, the brand moved from Ardmore to Callowhill in 2012, taking over The Studio led by Philly legend Larry Gold and cementing their place as the city's top recording studio. Now, with the release of locally made indie comedy "Slow Learners," Joyner and Lokoff are expanding MilkBoy's horizons again, all the way to Hollywood. The film's Friday, August 28 premiere at The PFS Roxy Theater in Center City will be the beginning of the end for a project many years in the making. After all, Joyner and Lokoff had always wanted to produce a film together and, over the years, MilkBoy has worked on plenty of film and TV projects. In fact, one of the first projects the pair worked on together was music for a film. "We were always doing things around the film world, whether it was sound design or music, and we got to meet a lot of the filmmakers and producers in the area," Lokoff said. So, with a story idea brewing, the pair turned to local Oscar-winning producer Tammy Tiehel-Stedman to get the project off the ground five years ago. Tiehel-Stedman had taken a break from producing to focus on her family shortly after winning the Best Short Film, Live Action award for "My Mother Dreams the Satan's Disciples in New York" in 2000. Luckily for Lokoff and Joyner when they came knocking she was getting back in the game, they said. After interviewing directors in New York and Los Angeles, Joyner and Lokoff found their dream team a bit closer to home in Philadelphia documentarians Don Argott and Sheena M. Joyce. As a director/producer team, respectively, Argott and Joyce created critically-acclaimed docs "Rock School," "The Art of the Steal" and "Last Days Here." Together they directed 2012's "The Atomic States of America," which was nominated for the Sundance Film Festival Grand Jury Prize. "We liked their local connections, we liked that the work that they do is always of a certain level. They had never directed a narrative before and so it was an opportunity for them to sort of transition to different work," Lokoff said of the team. Now all that was left for MilkBoy to do was raise money for the film. Easy, right? "That was the hardest thing ever. The hardest thing, for me, that I’ve ever done, or ever had to do," Joyner said. The team lined up a cast - with "Parks and Recreation" stand-out Ben Schwartz in top billing -- and set out to fund the film, planning to begin shooting in May of 2013. Unfortunately, not everything went as planned. "We were on a furious pace to raise the money and just not getting anywhere," Joyner said. "Eventually in May or June we had to call it off, and it was like calling off a wedding." Schwartz left the film and the producers fought to convince anyone who would listen that the setback was just temporary. Eventually, the money was raised and Schwartz was replaced with "Happy Endings" and "The Mindy Project" star Adam Pally. The film began shooting in Media in May of last year. The resulting film stars Pally and Sarah Burns as two dorky, off-kilter friends who set out on a quest to be cool. Like Pally and Burns, the supporting cast of "Slow Learners" is filled to the brim with hilarious actors many would recognize by face if not by name. From "SNL" stars Bobby Moynihan and Cecily Strong to "VEEP" players Reid Scott, Kevin Dunn and Peter Grosz, the movie is packed with comedic talent. Shooting in just 22 days meant the crew was working six-day workweeks, sometimes getting up at 4 a.m. and working until 8 p.m. before repeating it all over the next day. Of course, having plenty of good-humored people on set helped alleviate the stress of long days. "Some of the scenes on the set – I haven’t laughed that hard in a long time. Tears rolling out of your eyes. It felt great to be able to go to work and laugh," Lokoff said. "Sometimes the comedic relief was all gallows humor, too. Like how sh****, it’s pouring, we’re supposed to be shooting a sunshine scene when it’s a nice day. How are we going to get through this?" Joyner recalled. Despite the grueling schedule and the years it took to bring the movie to life, "Slow Learners" gave Joyner and Lokoff an even bigger appetite for producing films. While they're certainly not ditching their music business anytime soon (MilkBoy just opened Shake, another studio on the same floor of their current digs, for sound design and mixing), Joyner and Lokoff have their eyes peeled for new projects. Considering the movie had its world premiere at the Tribeca Film Festival earlier this year and was acquired just two months later for distribution by Sundance Selects, it's no wonder they'd like to keep the momentum going. "I think it’s what we want to do," Lokoff said. "You’re constantly evolving and trying to grow and seize opportunities and I think that it is something we want to expand on. MilkBoy started out as a studio in North Philadelphia and it’s grown and I think we’ve embraced that and embraced the change. The music industry has changed a lot in the last decade so we’re constantly looking for new opportunities. It’s rare that your first time out of the gate to make a film and have it get into a major festival and have it get bought and have it be released, so it’s a good start. It makes us want to do it." Joyner agreed. "There’s something there. We realize there’s something there." See "Slow Learners" at the PFS Roxy Friday, August 28 through Thursday, September 3. Argott and Joyce will make special appearances at screenings August 28 and August 29.